This race takes its name from the famous Madison Square Garden in New York. 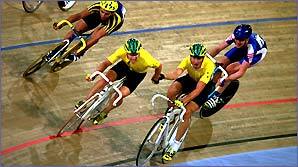 It is a version of the Points Race except that teams of two riders compete over a whopping 50km - 200 laps of the track! Now get ready for the funny bit! After a mass start where all the riders are on the track, only one rider from each team is allowed in the race at any given time. One rider races for a lap or more. Meanwhile the other circles the top of the track taking a breather before his team mate brings him back into action with a hand-sling. Basically this means he grabs his team mate's hand and passes on his momentum to him, propelling the slower rider along the track. Changeovers are pretty dangerous but quite impressive to watch if well done. If a team can gain a lap on the field then they are in the leading position of the race no matter how many points they have. But if all the teams are on the same lap at the end of the race then the one with most points bonuses is the winner. Well we hope we've shed a little light on the weird and wonderful world of the Madison! The Madison Square Garden is the venue for the New York Knicks NBA basketball team but it has also played host to concerts by, among others, John Lennon, Elton John, Madonna and The Pope.